Sometimes you have to wonder what goes through the mind of a copywriter when they come up with this stuff. 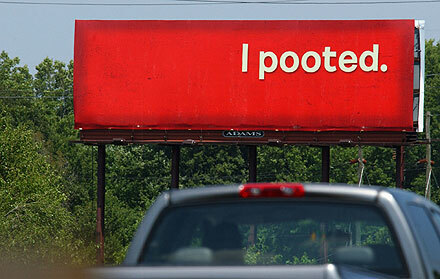 they're all over atlanta... i think it's for adult swim(cartoon network).. there's another that says: "I pooted." i like 'em.. then again.. i've got the mind of a 7 year old, so poop jokes are still pretty funny to me. hmm.. all the ones here in atlanta have an image of a cartoon network character in the corner of each of these bilboards... perhaps it's a different company? theyve been up in detroit for a while now. the headline live for about 2 weeks until the image of the cartoon character appeared with the adult swim/cartoon networdk logo. They are for Cartoon Network. There are a slew of them around Chicago. The "My boogers itch" has a Ren-looking character with a electric mixer blade in his nose. Which is ... great. This is actually a series of billboards for Cartoon Network, in about half a month they will put up a cartoon character next to the line. The tagline is Cartoon Network, YES! They did this in LA already and it had my friends and I guessing for weeks. Then rewarded us later. Pretty effective trickery. Cute, not really. The long line of "I Think" statements tell the story. A royal waste of thinking time. I like 'em. I get a laugh every time I see one, especially the itchy boogers one. Don't know what that says about me, but not everyone thinks they're stupid. These ads are brilliant. Visually appealing and simple to understand. See all the videos that correspond to the crazy billboards here. I think the campaign started around Cartoon Network's HQ in Atlanta and has spread northward. I still get a few hits from turner.com; I suppose to see if I've updated regarding the boards because they're full-on Cartoon Network ads now. I haven't. But I'm still the #1 result for "ipooted.com"! Woo hoo!